In an attempt to mend their mid-season decline, the Blues from the Garden City returned to their fortress to take on Minerva Punjab FC in the Hero I-League. However, they failed to maintain an all-win home record for this season and played a 1-1 draw. 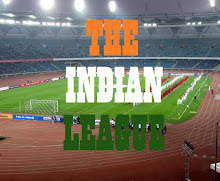 Captain Sunil Chettri (52′) gave them the lead, but the joy was curtailed when an own goal from Sandesh Jhingan (78′) equalised the score to eventually stay happy with the solitary point. Bengaluru came in the game with a lone foreigner in Cameroon Watson. They brought in Sandesh Jhingan and Salam Ranjan Singh in the central defence for their original choice of John Johnson and Juanan, who are out due to their suspension. Bengaluru FC, in their trademark way, were building the attacks from the back. Visitors could not damage much to the hosts’ defence. In the 9th minute, Vineeth was fouled by the Minerva left stopper back, which earned his team a free-kick. The free-kick couldn’t harm much to Minerva, but there was a follow-up that witnessed the first positive attack. BFC earned their first corner in the 11th minute, a quick snapshot by Captain Chettri from Cameron was efficiently blocked by keeper Arnab Das Sharma. A few minutes later, Vineeth came up hurriedly, latched the ball, and shot it diagonally, but couldn’t find his teammate in the second post. 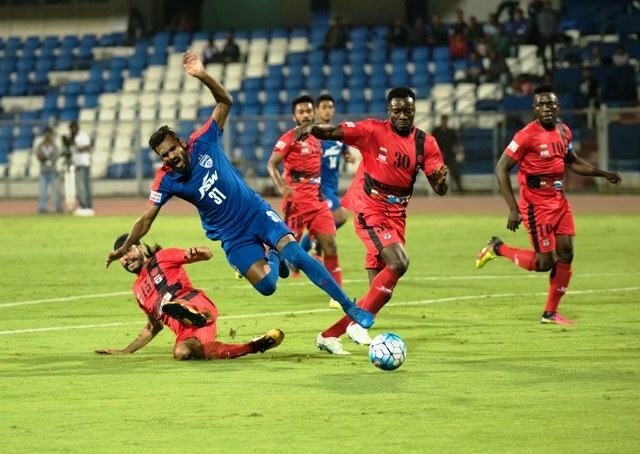 BFC came close again in the 33rd minute from a free kick from Sena Ralte, which was won from an infringement on Udanta Singh, but the strikers could not tap the ball inside the box. The only mentionable strike from the visitors in the first half came in the 35th minute, when left back Sena Ralte brought down Minerva’s Suouvik Das. Kareem Omolaja Nurain’s free-kick almost took a dip to the BFC goal after the ball got deflected by a defender. Minerva did well to keep the scoreboard blank at the lemon break. Bengaluru barged a series of attack at the beginning of the second half and kept the pressure in opponent’s half. The goal came in the 50th minute – Udanta ran down from the right flank and delivered a precise cross, Minerva defence failed to clear the ball, and Sunil Chhetri comes in, his half volley finds the ball at the back of the net. Minerva Punjab FC equalised in the 78th minute from a rather harmless cross from Germanpreet Singh. The ball bounced in front of a sliding Sandesh Jhingan, taking a touch which went into the goal, leaving keeper Amrinder completely off guarded. Keeping the Bengaluru attack on a check, Minerva defence committed too many infringements, inviting free-kicks near the 18-yard box, which eventually, the Steelmen failed to convert. At the end, much to the dismay of Albert Roca, the Blues had to share the spoils with Minerva Punjab FC, who are the first team to earn a point at the Shree Kanteerava Stadium this season until now.